Goodman Theatre’s recent cancellation of a fall production of Joan D’Arc has sparked an international outcry. Cutting the show from the Goodman’s 2009-2010 season has provoked a furious response from Airan Berg, artistic director of the performance component of the Linz09 cultural festival, held in the Austrian city of Linz. More here. here! 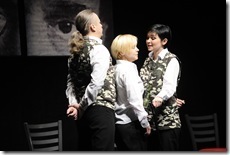 TV (the LGBT cable channel) will be presenting “The Awakening of Spring,” a televised stage play adaptation based on the controversial 1891 Frank Wedekind play. The hit Broadway musical Spring Awakening is also based on the same play. Written and directed by Arthur Allan Seidelman, this adaptation features a talented cast including Victoria Tennant, John Aniston, Constance Towers, Jesse Lee Sofer and Jason Graae. “The Awakening of Spring” makes its network debut on Friday, July 31st. Broadway’s Little Mermaid will close on August 30th, after 685 performances. 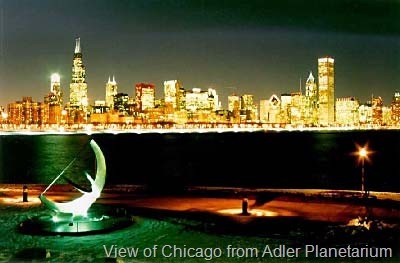 A national touring company has been assembled, with Chicago being one of its stops (produced by Broadway in Chicago). Gary, IN has requested that Michael Jackson be buried in his hometown, with the preferred burial site near a proposed Jackson family museum and performing arts center. 17 years after it was written, Chicago native David Mamet’s play Oleanna will finally open on Broadway on October 11th. 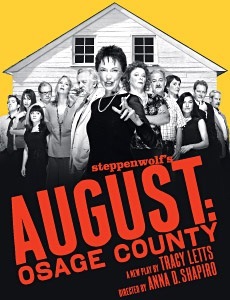 August: Osage County, written by Steppenwolf ensemble member Tracy Letts, winner of five 2008 Tony Awards, as well as the 2008 Pulitzer Prize, and currently starring Tony and Emmy award winner Phylicia Rashad, will play its final performance on SUNDAY, JUNE 28th, 2009. It will have played 648 performances and 18 previews, surpassing The Heidi Chronicles, Master Class, The Real Thing, and Doubt, among many others, to become one of the longest running plays in Broadway history. August: Osage County will begin its National Tour, starring Academy award winner Estelle Parsons, at the Denver Center for the Performing Arts on July 24th, 2009, before travelling to more than 18 locations all around the country. For more information and dates, please visit WWW.AUGUSTONBROADWAY.COM. The show currently boasts the most Award winning cast on Broadway: Tony winners Phylicia Rashad (“The Cosby Show”, Raisin in the Sun, Gem of the Ocean), John Cullum (Urinetown, Shenandoah, On the Twentieth Century), Elizabeth Ashley (Dividing the Estate, The Best Man), and Frank Wood (Side Man), with Original Cast member (and Tony nominee) Amy Morton, and Anne Berkowitz, Guy Boyd, Kimberly Guerrero, Brian Kerwin, Michael Milligan, Sally Murphy, Mariann Mayberry, and Troy West. The original Broadway company, directed by Anna D. Shapiro, featured Ian Barford, Deanna Dunagan, Kimberly Guerrero, Francis Guinan, Brian Kerwin, Dennis Letts, Madeleine Martin, Mariann Mayberry, Amy Morton, Sally Murphy, Jeff Perry, Rondi Reed and Troy West, with understudies Munson Hicks, Susanne Marley, Jay Patterson, Dee Pelletier, Molly Ranson and Kristina Valada-Viars. The design team included Todd Rosenthal (sets), Ana Kuzmanic (costumes), Ann Wrightson (lights), Richard Woodbury (sound) and David Singer (original music). The production received 5 Tony Awards, including Best Play, Best Director of a Play – Anna D. Shapiro, Best Actress in a Play – Deanna Dunagan, Best Featured Actress in a Play – Rondi Reed, and Best Set Design of a Play – Todd Rosenthal. 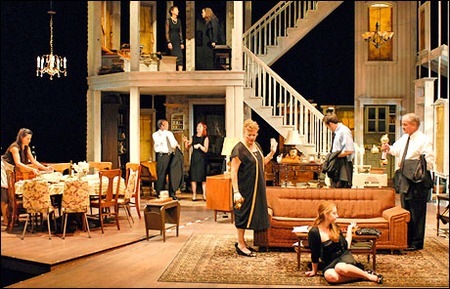 August: Osage County welcomed many prestigious new cast members throughout its run, including Academy Award winner Estelle Parsons, Tony Award winners John Cullum, Elizabeth Ashley, and Frank Wood. The cast also welcomed Tony nominee Johanna Day, Robert Foxworth, Molly Regan, Michael McGuire, Michael Milligan, Guy Boyd, Scott Jaeck, Anne Berkowitz, Samantha Ross, Jim True-Frost, and Amy Warren, with understudies Aaron Serotsky, Stephen Payne, Avia Bushyhead, Frank Deal, and Emily Walton.